When Leadership Lackawanna, the Greater Scranton area’s premier community education/leadership development program ( you can see business model canvas examples of theirs) , needed a facelift, they turned to the team at BlackOut Design. BlackOut designed a website that highlights the economic and cultural impact Leadership Lackawanna has had on Northeastern Pennsylvania since the group was created by the Greater Scranton Chamber of Commerce in 1982. 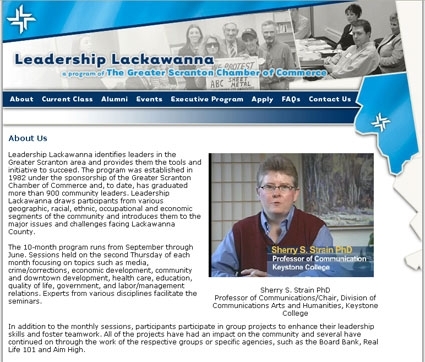 The redesigned site offers a wealth of information on the program and its initiatives to better serve the more than 900 local community leaders that have graduated from Leadership Lackawanna and to give interested applicants the tools they need to make a difference in the Greater Scranton area. View the results of BlackOut’s work at www.leadershiplackawanna.com.